For those of you who may be out of the loop… baby leg warmers not only exist… but they are gaining quite a bit of popularity. While I don’t think they will ever be the fashion accessory they were in the ’80s… they are back… at least in the world of infant clothing. You might assume leg warmers are only for baby girls… well… think again. There are complete lines of baby boy leg warmers too… and you know how much they cost? An arm and a leg… (bum bum cha). While far more convenient than their complicated cousin, better know as pants, I just can’t bring myself to fork over my cash for something I could easily fashion on my own. And… let’s be honest… while I’m perfectly fine letting Munchie romp around the house in some leg warmers… the kid is going to wear pants in public. I don’t want him growing up to think it is socially acceptable to wear leg warmers in public, in lieu of pants. This is also a good time to mention that baby leg warmers cover the full leg and not just the calf. Stretch them out… don’t bunch them up… they are back, but the 80’s scrunch trend is over. Now, the moment you have all been waiting for. How to make your own baby leg warmers. 1. Take a pair of socks (not the ankle ones… full size socks). 2. Put them on your baby. TA-DA!!! Baby leg warmers! With this version, your baby’s toes will also stay warm. 1. Take a pair of socks. 2. Cut off the toes. 3. Put them on your baby. BOO-YAH!!! 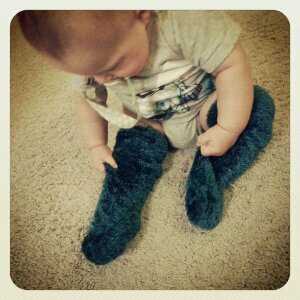 Fancy baby leg warmers! I have seen other moms use the arms of small sweaters, shirts, etc. It all depends on the size of your baby’s little (or not so little) legs!